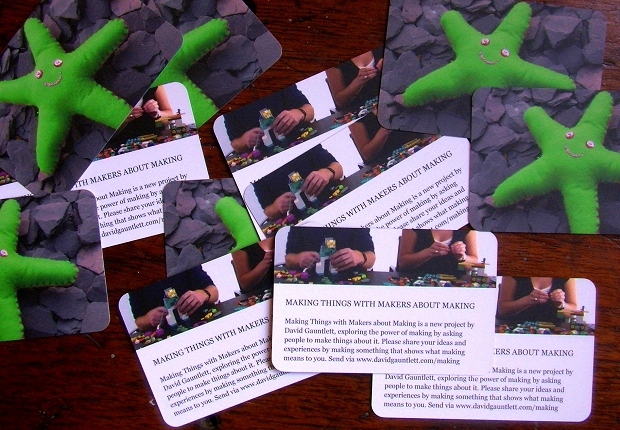 So the other day I was washing up, minding my own business, and then suddenly it struck me: Making Things With Makers About Making! I’d been wanting to have a nice new project, and here it was, all in one go, with those six words which – if you peer closely enough – give you the whole thing. It’s making things! With makers! About making! As you may or may not know, I teach at a university and write things about making (such as Making is Connecting), and also I make things, and I have developed a form of research where people make things as part of the process. So I’m interested in making: the how and why of people making things in everyday life, and the power of making as a choice to create for something yourself – taking an active step, making your mark – which changes how you look at the world; and I’ve previously invited people to make things as a reflection on issues and identities. But I hadn’t previously thought of turning the power of making upon the power of making itself! Of course, it seems obvious now. In the first phase, to get things going, I am inviting people to make something about what making means to them. Please – could you do this? It might be interesting…?! You can use the medium you most often use for your making – or a different one. That’s it! I’ll put all the responses online (so by participating, you are giving me permission to put your contribution on this site, although we can use a pseudonym or your initials, unless you are happy for your actual name to be given). In phase two, I might get small groups of makers working together, so they are Making Things With Makers About Making in a collaborative conversation. But that’s not yet. I would totally love it if you were able to respond by being a Maker Making Something About Making. Please do. Many many thanks! I spent a while being unsure quite how to display the contributions I’ve been sent. I didn’t think it through! For now I’ve started to put them up as guest blog posts, which seems to work ok, although appearing on the ‘David Gauntlett’ blog doesn’t seem quite right for these fascinating and diverse contributions which are not made by me. Nevertheless, you can view the gallery here.